Can Protein Startups And Their Investors Take On Big Cow? For many of us, our first experience with fake meat involves rubbery tofu that tastes more like sneaker sole than seared filet. As we forage on, next come the veggie burgers, the soy dogs, the meatless meatballs, the caramel-brown vacuum-sealed lumps called field roasts. Eventually, we grow accustomed to these chewy, protein-dense, vaguely meat-like foodstuffs. And yet, the dream lives on: What if fake meat tasted and satiated like the real deal? These days, startups are developing products that more closely resemble animal proteins. Venture capitalists and strategic investors are piling on, too, collectively putting hundreds of millions of dollars to work in companies developing meatless foods offering high protein and, in some cases, a meaty taste. Over the past two years, Crunchbase has identified about $250 million in disclosed investments in what we call the alternative protein space. Actual investment levels may be quite a bit higher as strategic investors don’t always reveal round size. While progress has been made, there’s work to be done. Heading to the Marina Umami Burger in San Francisco on a weekend afternoon, Crunchbase News ordered an Impossible Burger, a veggie patty heralded for its beefiness, and a regular burger made the same way. We then cut them in half and had each variety in sequence. Without question, the Impossible Burger was edible. It was not lumpy; it was not an old shoe. But it was also very much not a burger. It remains firmly a substitute, not a replacement. Luckily, there’s still plenty of capital sloshing around the fake meat venture ecosystem to fuel further innovation. Crunching the numbers, we’ve identified a few noteworthy trends for the alternative protein space. Here’s a quick overview of the key investment themes. It’s just as well there is no alternative protein unicorn. It just seems wrong to give a fake-meat company an animal moniker, even if it is a mythical one. That said, there are alternative protein companies that have raised substantial sums of venture capital. This month, for instance, Impossible Foods, maker of the aforementioned burger, closed a $75 million Series E round that brings total funding for the six-year-old Silicon Valley company to more than $250 million. Backers include Bill Gates, Google and Temasek. So if anyone’s going to be the first soy-based unicorn, it’s probably Impossible. The next most heavily funded company, Hampton Creek, has had its share of troubles delivering on its plan to produce veggie-based foods, in particular eggless versions of traditionally egg-reliant products like mayo. The San Francisco company has raised more than $200 million, including a $60 million round a year ago, and has its products on the shelves of major food retailers. But it has been in the news recently for internal problems, including the resignations a few weeks ago of four out of five board members. Beyond Meat is also bulking up as it distributes more veggie burgers and mock chicken strips to grocery chains. The eight-year-old company has only disclosed $17 million of its total investments, but the actual total is much higher since the last several funding rounds have been of undisclosed size. Most recently, Beyond closed a Series F led by Tyson Foods and General Mills. The interest of Tyson, America’s largest beef producer, indicates that “big meat” sees promise, and potential competition, in the space. Impossible’s quest began in 2011, with a five-year research project devoted to what creates the unique sensory experience of meat, and how to recreate it with plants. The closest thing Impossible has to an artificial meatener is an ingredient called “heme,” which is abundant in animal muscle and contributes to the characteristic color and taste of meat. The startup figured out how to take heme from soy roots and produce it using fermentation. 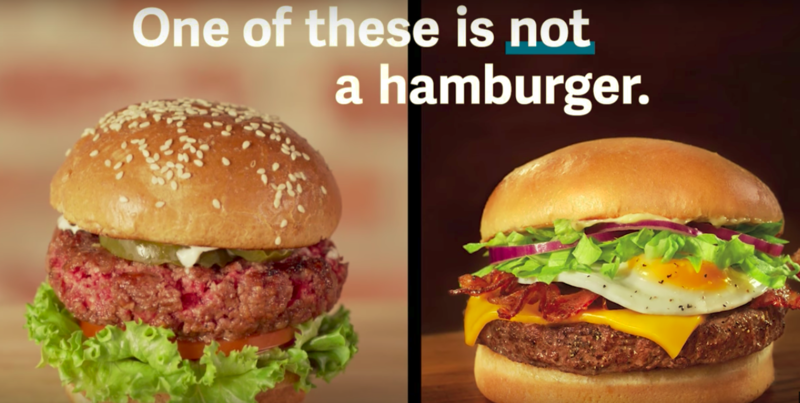 Beyond Meat, meanwhile, relies on pea protein for its meatless burger products. The startup uses “a proprietary system that applies heating, cooling, and pressure to align plant-proteins in the same fibrous structures that you’d find in animal proteins.” Beyond also adds yeast extract for flavoring, as it contains amino acids, including Glutamic acid, that add something resembling a savory meat taste to its faux beef and chicken. Another approach, not targeted to those on a solely plant-based diet, relies on producing meat from animal cells, eliminating the need to raise livestock. Memphis Meats (actually based in San Francisco) has raised $3 million to pursue this goal. The startup isn’t selling products yet, but it has unveiled some of what it’s cooked up in labs, including a meatball, chicken and duck. Hampton Creek has also announced plans to deliver lab-made meat as early as next year. Not all the alternative protein investments are around mimicking meat. There’s also high consumer demand for healthy, convenient sources of protein, whether it’s in the form of pasta, shakes, chips or even water. And these days, it seems like everybody wants more protein. While dieters cut carbs and slash fat intake, protein generally gets a pass, seen as a source of “good calories” that promote satiety and sustained energy levels. And although the pros and cons of high-protein diets are a topic of continued debate, there’s broad consensus about the value of high-protein foods in a balanced diet. Startups are seeking to address the cross-section of consumers who want the protein, but prefer to limit or avoid consumption of animal products. Most recently, Detroit-based Banza raised $8 million to scale up production of chickpea-based pastas that offer a few grams more protein per serving than wheat-based varieties. At least three protein and meal-replacement beverage providers, Koia, Protein2o and Soylent, also closed multi-million-dollar rounds in the past three months. Soylent alone has raised more than $70 million to date to sell more beverages fortified with soy protein. Lastly, we look at bugs. Many bugs, and grasshoppers, in particular, are high in protein. They’re also commonly eaten in many parts of the world, and potentially marketable as feed source for livestock. And after looking at round counts, there are actually quite a few recent deals involving bug farmers, bug protein products and marketers of said products. The Crunchbase database contains at least five companies in the insect protein space that have secured funding. The largest funding recipient is Exo Protein Bars, which makes snack bars containing cricket flour. The most recent funding recipient, meanwhile, is Hargol FoodTech, an Israeli startup that raised $600,000 this summer to build what it claims will be the world’s first commercial grasshopper farm. Given that there’s not a lot of venture capital directed at this space, we’ll have to wait and see if it develops into something bigger. Anyone who thinks today’s alternative protein products sound too weird to satiate mainstream appetites should consider how drastically eating habits have changed over the last few generations. Some of the most popular meals of the 1900s apparently include a number of dishes, like chicken pudding and liver loaf, that would repel modern palates. Fake-meat companies can get acquired for lots of money, too. Just ask Quorn Foods, whose private equity backers sold the company to Philippines food conglomerate Monde Nissin in 2015 for $830 million. Quorn describes its veggie protein recipe as “taking a natural nutritious fungus from the soil and fermenting it to produce a dough called Mycoprotein.” Doesn’t sound too yummy, but apparently, the process produces tasty mock ground beef and chicken cutlets.